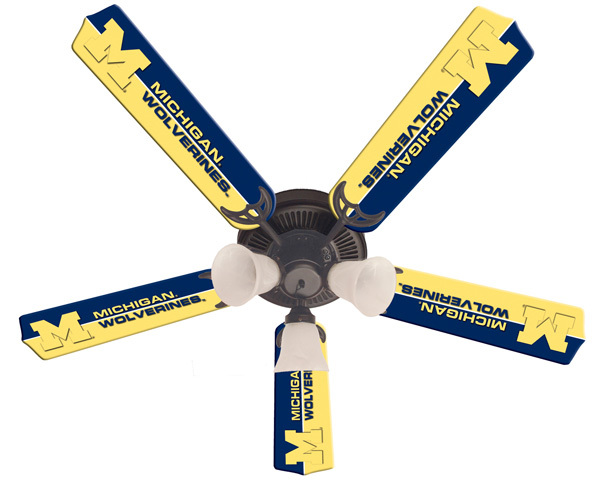 Wolverines Fans, stay cool and show your team spirit with an officially licensed Michigan Wolverines 52 Inch Ceiling Fan! Perfect for any fan cave, child's room, office, den, garage, playroom, bedroom, restaurant, etc., it has a convenient three speed switch for year round comfort. Summer-forward air motion creates a cooling breeze and winter-reverse air flow recirculates rising warm air. The alabaster-style glass lights use 60W bulbs. The ultimate addition to any fan's room!